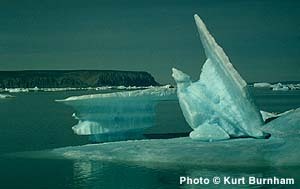 "Glaciers Left Their Mark on the Mississippi River"
By Pat Middleton, Ruth Nissen, Wisconsin DNR and other Contributors. Additional Links at the bottom of the page. The Mississippi River, like all rivers, is in a constant state of change. Various forms of the Mississippi River have flowed through our area for more than a million years, but the Upper Mississippi River Valley as we know it was primarily shaped during the most recent glacial stage of the Great Ice Age, The Wisconsin period. The Wisconsin glaciation period started about 75, 000 years ago and ended about 12,000 years ago when the North American climate began to warm. It was a world hardly recognizable today. Minnesota and Wisconsin were populated by a variety of very large animals called megafauna which lived in the cold climate on the margins of the glacial ice. Because larger animals lost body heat more slowly, bigger was indeed better. Giant-sized animals including mastodons, mammoths and caribou roamed this area. Because of the north-south orientation of the river, many of our ancient fishes had merely moved south as the waters grew too cold, and then expanded back into the northern portion of the river as the glaciers retreated. Ancient fish that predate the glaciers and still live in the waters of the Upper Mississippi River include long-nosed and short-nosed gar, sturgeon and paddlefish. The St. Croix River which drained Lake Duluth, a glacial lake that covered the western Lake Superior basin, joined the River Warren about 30 miles downstream from the present confluence of the Mississippi and Minnesota Rivers. In Wisconsin, another glacial lake drained first into what is now the Black River and later the Wisconsin River, both of which emptied into the River Warren. During the 3,000 years that River Warren carried water from these and other smaller glacial lakes, the Mississippi River valley was carved bluff to bluff and the resulting valley was approximately 250 feet deeper than it is today. However, there is also evidence that the main valley is much older than the River Warren and underwent several cycles of cutting and filling during the Great Ice Age. Even though the Coulee country escaped the land-leveling effect of the ice mass, the glaciers left their mark by carving the spectacular Mississippi River that cuts through the heart of this area with the torrents of water draining from the melting ice mass. With the demise of the glacial lakes, the tremendous flow of water was diminished and the Mississippi River became the most important stream in the area. The many tributaries continued to bring in sand and gravel (sediment) into the wide deep valley of the Mississippi that the river could no longer carry away. Consequently, the sediment began to fill in the recently scoured river valley. At each point where major tributaries joined the Mississippi River, natural sediment dams eventually built up to pond the upstream portion of the river, forming a natural river lake. The largest is Lake Pepin which at one time extended all the way up to St. Paul. Read more about the effects of the Ice Age on the Mississippi River and the people who live along it today! The New Madrid Earthquake, the effects of flooding since the construction of Locks and Dams, stats on the floods of 1993 and others... and more... are included in DISCOVER! America's Great River Road, an indispensable 4-Volume guide to "life along the Mississippi River." Save $10 when you purchase all four volumes! $62 rather than $72! To man, a hundred years is a long time; however, that perspective changes when one realizes that the Upper Mississippi River as we know it has been in existence for 10,000 years. Knowledge of the past can help us to better understand and appreciate the present day Mississippi River. According to some scholars, catastrophic walls of ice broke off from the receding glaciers and joined a massive run-off of melt-water, scouring out the contours of the Mississippi River. It is envisioned that a sudden collapse of the NA ice cap produced a massive sea-level rise with the speed of a tidal wave around the world. It is likely that the river valley in the upper Mississippi was once 500 feet deeper than it is now, filled as it is with gravel and sand deposited by that melt-water. The accumulated Gulf of Mexico organisms have provided compelling evidence of a vast flood of fresh water about 11,600 years ago. "The present lower Mississippi River Valley is underlain by an aulacogen, that is, a rift that developed perpendicular to the larger Gulf of Mexico rift. Occasionally earthquakes reflect continuing movement along its marginal faults, including the most severe one in United States hiistory, at New Madrid, Missouri, in 1811-1812" (Dott and Batten, 1988).. This triple juction (triple junctions form at the location where supercontinents break up forming aulacogens) may have formed sometime during the Jurrassic Period as North and South America began separating (Dott and Batten, 1988). According to Liang (1991), major rivers are often located at the site of a failed arm of a triple junction, with massive deposits of sedimentary rock filling the linear basin along the trend. Therefore the lower Mississippi River Valley was probably formed during the Jurassic period, some 208 million years ago, as a failed arm of a triple junction. According to Ojakangas and Matsch (1982) large glacial lakes were formed as the glaciers retreated--the largest of the glacial lakes, Lake Agassiz, was formed as the Des Moines Lobe of the glacier retreated some 12,000 years ago and the drainage of this approximately 320,000 square kilometer lake may be responsible for the formation of the Upper Mississippi River Valley--the rivers were responsible for draining the large amounts of water from the melting glaciers. Ojakangas and Matsch indicate that Lake Agassiz probably drained via the Minnesota River into the present day Mississippi River (1982). For more information: Dott, H.R., R.L. Batten. 1988. _Evolution of the Earth. Fourth Edition._ New York. McGraw-Hill Book Company. p463, 555. Laing, D. 1991. _The Earth System. An Introduction to Earth Science._ Dubuque, IA. Wm. C. Brown Publishers. p. 134. Ojakangas, R.W., C.L. Matsch. 1982. _Minnesota's Geology._ Minnesota. University of Minnesota Press. p110. Another Letter from our expert Readers! Drainage patterns feeding sediment into the Gulf of Mexico have evolved during the ice ages, changing from a pattern of multiple moderate size rivers (Rio Grande, Sabine/Red, Mississippi, southern Appalachian) to a system dominated by the modern Mississippi. There is a map which illustrates the process published in this article: Prather, B. E., Booth, J. R., Steffens, G. S., and Craig, P. A., 1998, Classification, lithologic calibration, and stratigraphic succession of seismic facies of intraslope basins, deep-water Gulf of Mexico: AAPG Bulletin, v. 82, p. 701-720.